The Institute of Culinary Arts was announced City & Guilds’ 2016 International Center of Excellence for Africa! What an achievement for one of the smallest culinary schools, to walk away with top honours as the continent’s very, very best! Global skills development leader, City & Guilds, recently awarded the ICA as the best training school in the whole of Africa! No less than ten thousand training facilities across the globe were externally verified and scrutinized for constant outstanding training deliverance. This is the first time since the 1900’s that City & Guilds have bestowed such an esteemed honor to only 3 international chef schools, globally, who have met the utmost criteria of excellence world-wide and the ICA proudly stood out as the Centre of Excellence on the continent. Competing against schools with intakes of thousands of students each year, the ICA, with its intensive training ethos of lecturer-to-student average ratio of 1:6, counts as one of the smallest chef schools in the world, yet was awarded foremost Centre of Excellence. At the Institute of Culinary Arts (ICA), 2016 marks 21 years of outstanding training, inspiring world-class culinary arts graduates and professional chefs to set benchmarks, push boundaries and breathe innovation into the culinary industry. Award-winning chefs, trained by the ICA, have over the years dominated SA’s “Eat-Out Best Restaurant” awards lists and more than twenty ICA graduates ranked in the top awards over the past five years – an achievement greater than ány other culinary training facility in the country. The focus at the magnificent Stellenbosch campus falls on intensive individual training for small, select groups. Students are exposed to the full circle of an holistic approach to all things food-related, from harvesting fresh herbs, olives and fruit in the organic gardens and using only the best produce during the practical curriculum that remains based on classical French cuisine principles, to – at the end – recycling the rest for compost and fertilizing purposes as well as being actively involved in local feeding schemes – all of which instill a deep-routed appreciation for the trade of a chef. Courses offered by the ICA includes various 2-year courses specializing in Advanced Culinary Arts or Pâtisserie and the flag-ship 3-year course encompassing both the above, as well as specializing in Media Communication, Product Development or Professional Restaurant- and Events Management. All students undergo international City & Guilds examinations which are recognized and honored in over one hundred countries globally and for which the ICA proudly sustains a consistent 100% pass rate. 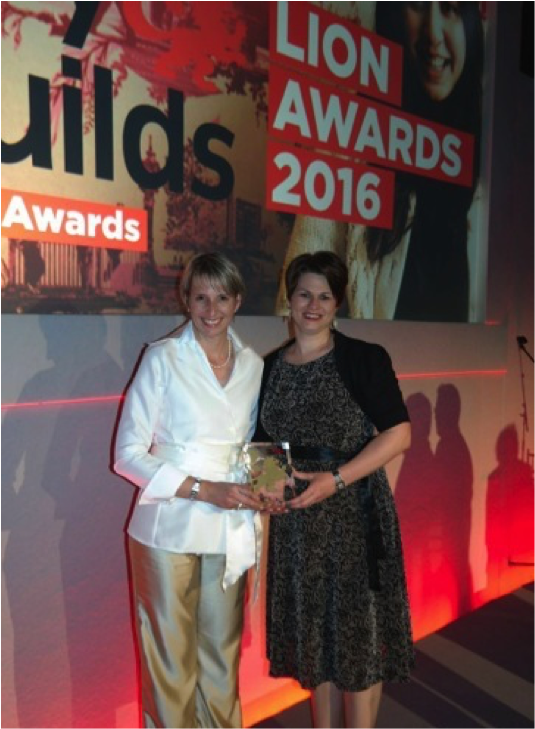 ICA Head of Faculty, Merizle Mitrovich (left) and Student Administrator, Marisa Joubert (right) attended the prestigious 2016 City & Guilds Lion Awards in London and proudly accepted this prized accolade to bring back to the ICA campus.